It’s been awhile since I last participated in a Daring Cooks Challenge. The last few months have been quite hectic, and the challenges just didn’t fit into my schedule or my menu. This month’s challenge was a different story. Potato salad is one of my favourite summer side dishes and as soon as we planned a hamburger night I knew I’d have to make some. I headed to the market to find some inspiration, but it’s still a little early in the season for most vegetables here so the only thing that caught my eye was radishes. Their bright pink colour just spoke to me. I decided to roast the potatoes to give this recipe a twist on a traditional potato salad, and wonder what would happen if I roasted the radishes as well. I quick Google search told me that radishes can indeed be roasted. So my salad was planned. It’s quite simple, but since I was experimenting, I didn’t want to throw too much at it. My mom repeatedly requested bacon bits, as “a little bacon never hurt anyone”, but I decided to stick to the healthy aspect of the challenge. In the end, I don’t think it needed bacon, but I’m sure it wouldn’t have hurt. After roasting, the radishes lost their peppery flavour. Instead they were actually quite sweet, sort of like a roasted turnip. In the future, I think I might do a combination of roasted and raw radish, to get both the sweet and peppery taste. The raw radish would also add a little crunch. 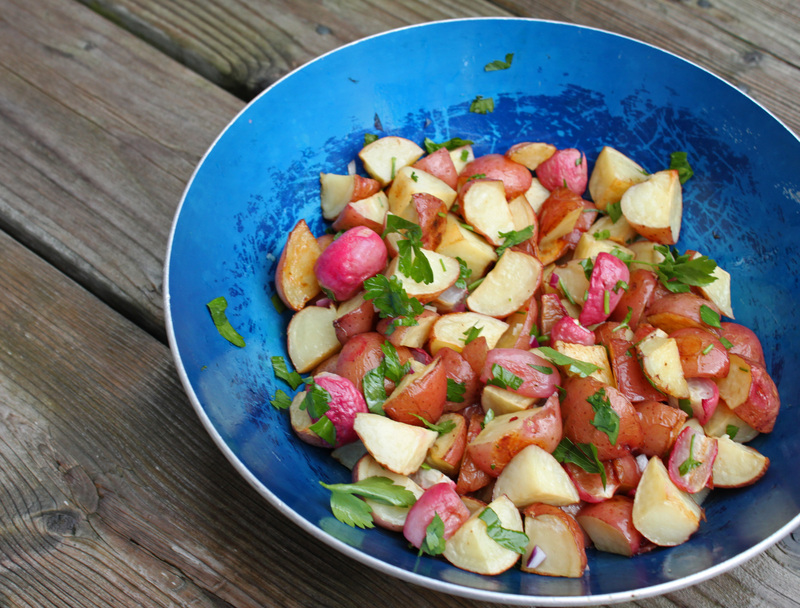 Toss the potatoes and radishes with olive oil. Season with salt and pepper. Pour onto a baking sheet and roast for 45 minute to 1 hour until they are cooked through and lightly browned. Let the potatoes and radishes cool slightly, then pour them into a bowl. Add the parsley and red onion. Make the dressing: Whisk the olive oil, vinegar, mustard and honey together. Season with salt and pepper. Pour over the salad then toss to combine, making sure the salad is well dressed. Wow. I’ve never tried a roasted radish. I think I might just have to now! The raw radish would definitely be a nice touch, both for texture and flavour. Roasted radishes? Very intriguing. I’ll have to give them a try. Your potato salad looks great! I love roasting just about anything, but I never new you could do radishes. Thanks for describing the change in flavor and what you would do next time. What a lovely, elegant dish. The radishes look beautiful running through the salad. I’ve never thought to roast them before. I must try it. Your radishes look so pretty! This potato salad looks great – way better than potatoes covered in mayo! 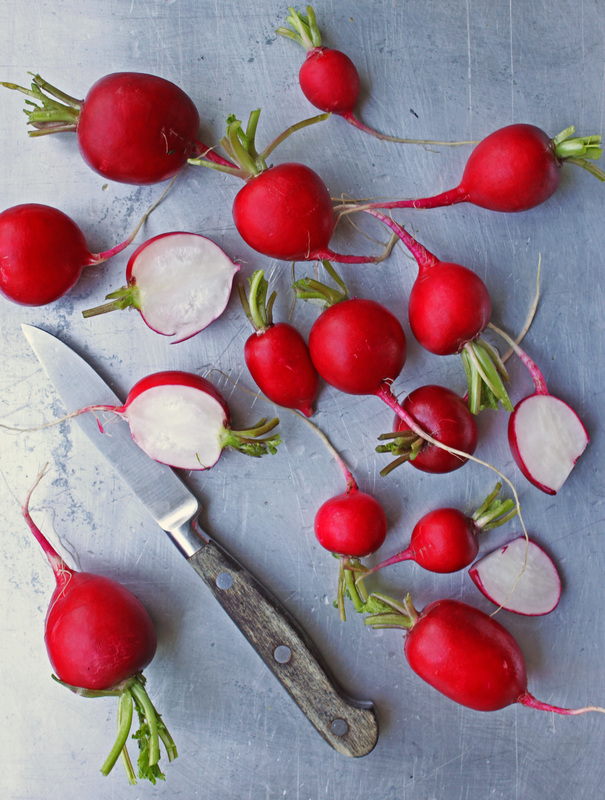 mmhm, roasted radishes, I’ve never had them but it seems like the perfect idea! looks awesome! Looks so lovely and summery Lynn! I’ve never tried roasting radishes before. Last time we bought radishes they were too sharp and peppery, so I guess I should have roasted them! I love this idea! Potato salad is one of my favorite things, and I usually roast the potatoes when I make it myself. However, I never thought of adding radishes! Great idea for crunch and spice. Thanks for sharing. I cooked radishes for the first time over a year ago. I put some whole into the crockpot the last hour with a chicken and other veggies. AWESOME! Next was with a beef roast. Again, they were sooooooo good! Now I cook them all the time with other vegetables.